Good news for fish: Conservationists will soon be able to track large commercial fishing vessels when they traverse areas already struggling because of overharvesting and illicit catch tactics. Thanks to new satellite technology -- and funding from Google -- marine advocate groups will be able to prevent illegal fishing operations from wreaking havoc on sea life around the world. 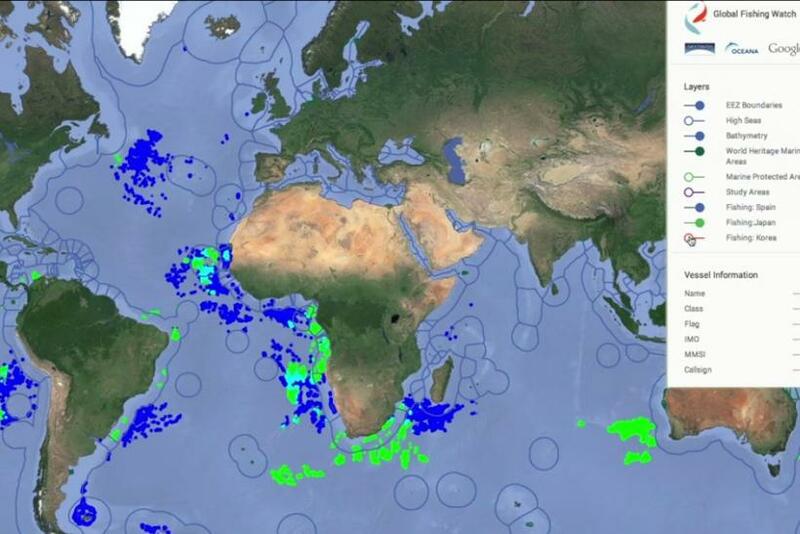 With technology known as the Global Fishing Watch, a prototype of which was unveiled Thursday, advocates can catch illegal fisherman in the act by following the boat’s GPS signal on an advanced map that operates in real time. Oceana, a prominent ocean protection group, led the effort and software was developed by SkyTruth, a nonprofit watchdog that has also mapped controversial fracking and oil operations. Financial and engineering support comes from Google, which has provided the satellite data obtained for Google Earth. Along with access to Google mapping data, the advocates also have information gleaned from four SpaceQuest-operated satellites that track each ship’s individual automatic identification systems (AIS), which includes a unique ID number, current position, speed and other revealing information. Overfishing has quietly become one of the most serious environmental issues in the world, with the journal Science warning that if current fishing rates continue, then all of the world’s fisheries will have collapsed by the year 2048. The problem also leads to a domino effect that’s slowly crippling the world’s marine population, with sardine overfishing cited as a major factor in the malnourishment and death of more than 1,600 California sea lions earlier this year. Brian Sullivan, a program manager with Google’s Ocean and Earth Outreach program, told Wired that the new technology could someday help eliminate the motivation to fish illegally. The project, still in development, is expected to cost $3 million to $5 million and be available for public use within the next two years. The project would be more costly if it didn’t rely on the AIS sensors, which all fishing vessels are required to have while at sea. Developers conceded that criminal fisherman have been known to turn off their AIS before entering a prohibited area, though that tactic could easily backfire. What's Next For Commercial Space In Wake Of Dual Disasters?